This weekend I raced the Columbia Trail Challenge. 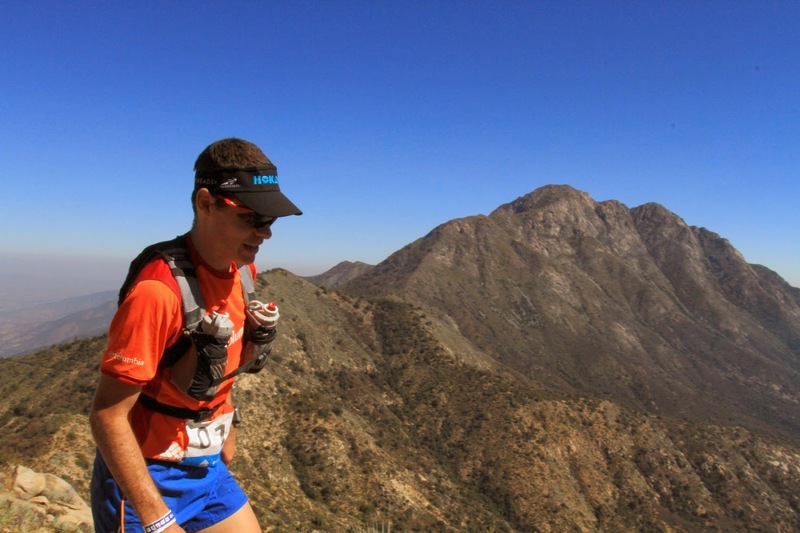 It was a two-stage 70km trail race near Olmué in Chile. I was invited to run the race by a friend, Diego, and because it fit in well with my training program I decided to go for it. It turned out that all my bossjogging buddies would be there racing and that it would be a running send-off for Pat who moved back to Michigan the day after the race. With all these factors lining up before the race I knew I would have a good time and do some excellent training for my next focus race (the Jungle Ultra) so I was looking forward to my first race of 2014. The bosses before the race. The first day was the longer of the two days and the route was tough. A lot of my training is on relatively flat routes, as this is more closely aligned to my current focus of stage racing, so I knew I had to be careful and conservative on this route with almost 3,000m of climbing. I started the stage with the front group and held an even effort as we started the first climb of the day. A few people ran away from me and the group split quite quickly, but I was happy to stick with my plan and stay within myself. At the top of the first climb I had caught a few people and I was still feeling strong so I continued with the plan. Rolling along with Moises during the first section of the day. There was an amazing long section of downhill running on a dirt road and I flew down this! My technical downhill running is not always a strong point, but this easy trail and the Hokas on my feet meant it was "Time To Fly". I started the next climb feeling energized and excited about how quickly the last few kilometers had ticked by. It was another big climb, this time up a route to La Campana that I had hiked last year with V and some friends. It was awesome to know where I was and also to know that I would see some of the famous Chilean palm trees that only grow in this region. I held the effort steady and by the top of the climb I had caught up to Moises which was a great sign as I know he is a strong climber and that he loves this sort of terrain. A lot of climbing means spectacular views! Unsurprisingly the profile was right and the distance was not! The final climb was brutal. It was up to a set of antennas with the last half of the climb on a dirt road leaving us to scorch under the direct sun. I struggled up this climb, ran out of water again, and had a few questions about why I was still out there. Fortunately the climb did end and it was all downhill to the finish. I ran as smoothly as I could with a very strong desire to finish this stage and get out of the sun. I arrived at the finish in 4th place after 6hrs of running. A very tough first stage and a very tired runner. This was definitely one of the most difficult racing days I've had and it seemed that everyone felt the same. The spread of time from first to tenth was more than two hours, many runners came in after nine hours, and the race support vehicle kept arriving back at the finish with runners who had abandoned the race (at least 15 in total). I wasn't sure if I wanted to do the next stage, but my stage-racing routine kicked in and after rehydrating, resting and cleaning up I was starting to look forward to it. After the huge first stage I expected to feel sore and tired in the morning of the second day. However, I felt quite good and ready to go which is a sign that my training is working and I'm in pretty good stage-racing form. The stage started off fast because there was a separate race for people who only wanted to run the second day and we all started together. Again I started conservatively knowing that there was a big climb coming later in the day. I made sure to keep my bottles full and drink often after the first stage's difficult heat although a cooler day with some fog meant that this wasn't as important. Rolling along after the start in cooler weather. I started the long climb and was quickly reduced to a power hike. It was almost 1,000m of climbing in about 4km which is steep! I'm not the hugest fan of power hiking up steep terrain for long periods of time and as this took almost an hour I wasn't enjoying myself that much. However, my conservative pace at the beginning of the stage resulted in me catching quite a few runners ahead of me including the second and third runners from day one. First place from the previous day had already retired (having run too hard on that difficult stage) so I was moving up in the field. I was hoping to catch Moises again, but he was on his favorite type of terrain and I never saw him for the rest of the day. From the peak of the climb was a long section of technical descent and a small climb again to the antenna that we had climbed to in the final part of the previous day's stage. Fortunately it was not as hot and we were approaching the antenna from a different side along a ridgeline so we didn't have to repeat the long and hot climb. This was definitely one of the best sections of running over the two days. It was mostly runnable with views over Olmué and the whole valley below. I held my position from this point all the way to the finish. The last two kilometers were level and I felt that I was running the strongest and fastest I had in the whole race. It was an amazing feeling and exactly the type of response that I wanted as it gives a good indication that I would be able to run a few more days which will be required in the jungle. I finished strongly on the second stage. Overall I came in third with 9hrs30min of running. This was a great result for me and I was pleased to keep up and manage myself well over mountainous terrain. I have definitely got some skills to improve on and could do with more mountain-specific training if I want to run these types of races. There is a lot of opportunity to improve! However, my fitness is at a great level and I'm already looking forward to my next race which will perfectly match my training and preparation focus. The bosses after the race. On the podium with Moi (2nd) and Luis (1st). Thanks to my sponsors for their support: 32Gi nutrition for during the run and recovery, Hoka One One for my Stinson Trails and Injinji for looking after my feet.